Fred N. Johnson recently updated his continuing analysis of The Camp Duty. His analysis, titled "The Mother And The Three Camps", can be downloaded in PDF. Provide a brief history of The Three Camps. Clarify historical, contemporary and modern notation to help some drummers better understand and enjoy playing this historical beating. Clarify performance characteristics that have been altered or misunderstood over time. Provide an instructional document by way of examples and explanations of roll notation and varying roll velocities transcribed into modern notation. Invite input to further enhance this piece for continued publication on the Canadian Associates Drumming Rudimental Excellence (CADRE) website.\4\"
2 Referred to throughout this paper as “The Three Camps”. 3 Songs & Music of the Redcoats 1642–1902, by Lewis Winstock. The Rope Drum Corps uses Civil War era drums at events such as Ivy Cutting on the Seattle Pacific University campus, giving listeners an opportunity to hear drums that once lead soldiers into war. To be a drummer boy in the Civil War was one of the most dangerous positions in the regiment. Because it was his job to signal the troops to assemble, advance, or retreat, he was often targeted by the enemy. Every military commander understood: Kill the drummer and silence the drum and you will throw the opposing regiment into confusion and chaos. He knows that many collectors of the rare and expensive Civil War drums preserve them by leaving them to sit unseen on a shelf. He takes a different approach. “These things need to talk, to be heard. No two sound exactly alike.” Like old sailing ships, the drums are constructed of whatever wood was available in the area at the time, mostly the maple and ash of the eastern hardwood forests. 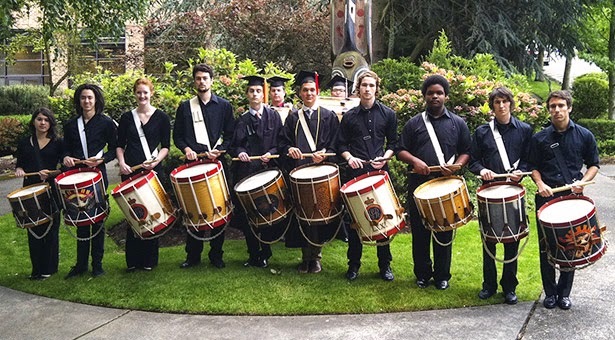 The SPU Rope Drum Corps leads the processional of faculty and graduates at Ivy Cutting, plays for area Memorial Day commemorations, regales audiences at the Northwest Percussion Festival, and performs at two campus concerts in winter and spring. 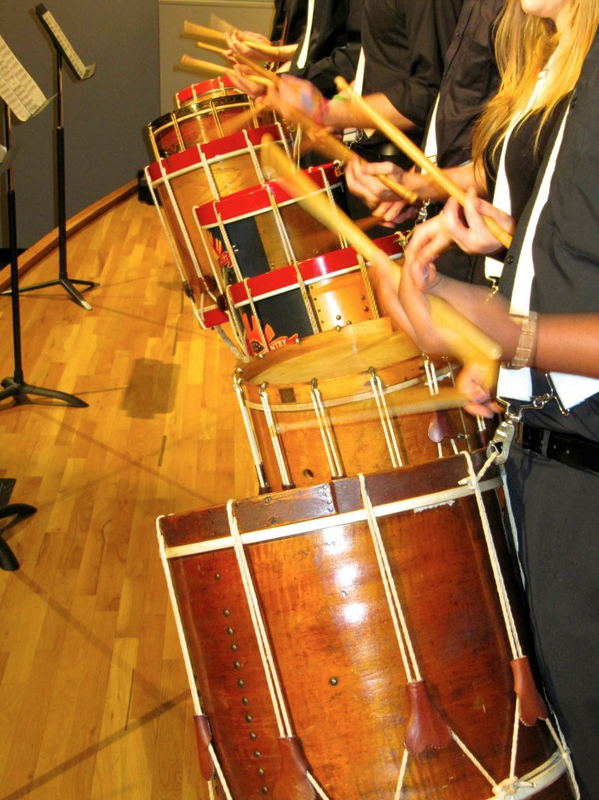 The March 5 percussion concert at 7:30 p.m. in E.E. Bach Theatre was free, open to the public, and featured the historic drums. Adams’ interest in the drums blossomed in his student days when he visited Civil War battlefields, bought a “pretty beat up” battle drum to restore, and “got the bug.” He has grown experienced in spotting fakes (“watch for makers labels on the inside of the drums”) and always keeps his eyes peeled for additions to his collection. And he thinks back to those little drummer boys, most too young to fight, who risked their lives to guide the troops. 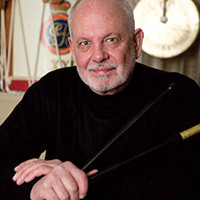 Dan Adams, the director of Percussion Ensemble, has been director of percussion studies at Seattle Pacific since 1988. Mr. Adams earned a Bachelor of Music Education degree from the University of Idaho and a Master of Music degree from the University of Washington. His principal teachers have been Howard Robbins, Joe Morello, Peter Erskine, Babatunde Olatunji, Adebisi Adeleke, Tom Collier, and Jim Chapin. 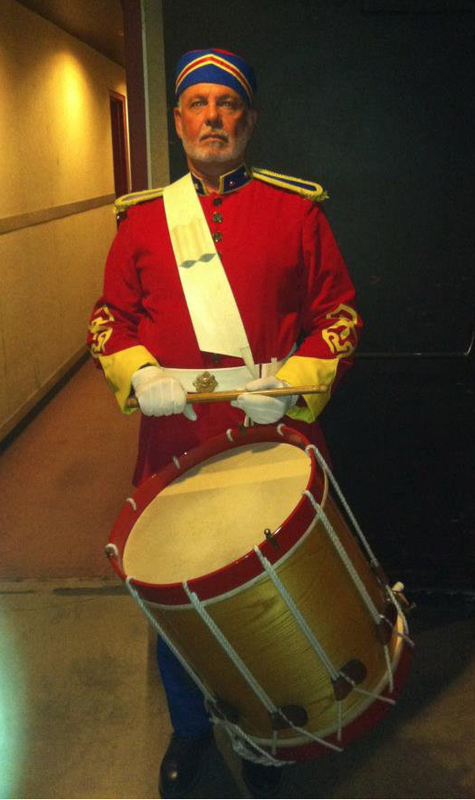 Mr. Adams has more than 40 years' experience as a private percussion instructor. He has served as the district music supervisor for the Rainier School District and, since 1978, he has been a special percussion consultant to the Olympia School District. Mr. Adams has performed with the Ashi Opera of Japan, Pacific Northwest Ballet, Allegro Dance Series, Pacific Northwest Chamber Chorus, Orchestra Seattle, Olympic Brass Ensemble, Seattle Pro Musica, Choir of the Sound, and the Seattle Gilbert and Sullivan Society. His musical theater credits include the Civic Light Opera, Tacoma Actors Guild, Chinook Dinner Theater, Washington Center for the Performing Arts, the Village Theatre, the Renton Civic Theater, and the Bagley Wright Theater. He has shared the stage with artists such as Johnny Cash, Ricky Skaggs, Pam Tillis, Delbert McClinton, Albert Collins, Hal Ketchum, Chaka Khan, and Etta James. His recording credits include Messenger, the Soni Ventorum, the Diamonds, Ventures guitarist Nokie Edwards, Primo Kim, the Mazeltones, Gene Nygaard, Lucky Garcia, Greg Adams of Tower of Power, Forrest Lee Jr., contemporary artist VEO, and Orchestra Seattle. Visit his website at http://www.danadamspercussion.com.